Check out this beautiful Justice League of America statue based on the breathtaking art of Alex Ross entitled “Original 7”. Produced by Factory Entertainment, the Justice League Original 7 statue captures, in sculpted form, the JLA’s original members in Alex Ross' unique style. It features DC Comics icons Batman, Superman, Wonder Woman, Green Lantern, The Flash, Aquaman and the Martian Manhunter. With input from Alex, Factory Entertainment’s designers spent many hours studying Ross’ original painting to ensure that they captured its artistry when translating the 2D artwork to a fully sculpted form. The company then selected a master sculptor to effectively render Alex’s vision as a sculptural fine art piece. 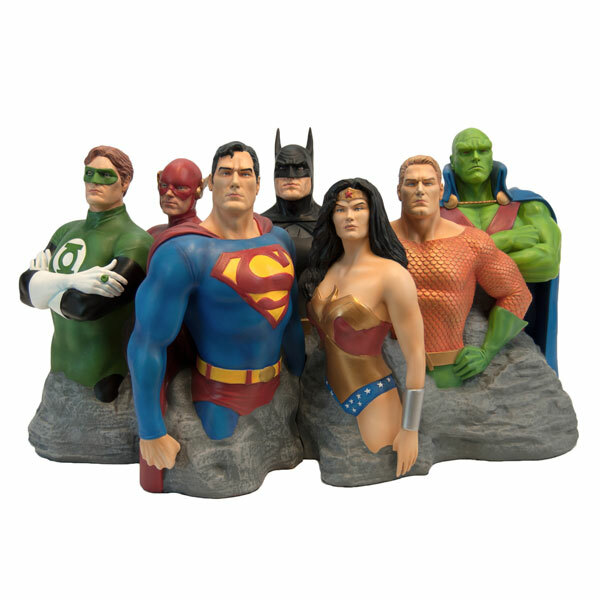 Each Justice League Original 7 fine art sculpture was then cast in heavyweight polystone and hand-painted. Each Justice League Original 7 Fine Art Sculpture by Alex Ross comes individually numbered and includes a high quality lithographic print of the original artwork! The massive 22 pound statue measures approximately 16” long x 10” tall x 9” wide. Insane, right!?! This would definitely make the perfect centerpiece to any DC Comics collection. Limited to just 500 pieces, fans can pre-order this true art multiple now at Entertainment Earth for $499.99 here.